Epoxy Patching Mortar #10 for patching. Coated with Urethane Decking System #495. Epoxy.com Product #10 is a versatile resin for use in epoxy floor patching. Product #10 comes in standard cure, fast cure and cold cure. It can be used with 3 different aggregates: self leveling, mortar blend, and broadcast aggregate. Product #10 is available in 15 colors plus black and white making a total of 17 colors available. Custom colors are available at a small additional cost. Normal Cure at 77 degrees F. has a pot-life (the usable time after mixing) of about 30-40 minutes. It hardens to the touch in about 10-12 hours. Normal Cure should never be used below 50 degrees F.
Fast Cure at 77 degrees has a pot life about 15-20 minutes. It hardens to the touch in about 5-6 hours. At 50 degrees F the Fast Cure hardens to the touch in 10-12 hours. In other words the Fast Cure at 50 degrees will cure as fast as normal cure at 77 degrees F.
Cold Cure at 77 degrees F. has a pot-life of about 8-10 minutes. It sets hard to the touch in about 2.5 to 3 hours. At 50 degrees F the cold cure will typically cure in 5-6 hours. It is able to cure at temperatures as low as 35°F. The aggregates come separately from the Product #10 resin and hardener. That allows you to be able to use a unit of resin with multiple aggregates making the system even more versatile. Mortar Blend Aggregate Product #82 is the work horse of floor patching. You can get up to 50 lbs or more of Product #82 into a mixed gallon of #10 epoxy mortar. This is ideal for deep patching. Self Leveling Filler Aggregate Product #78 is used for self leveling applications, typically in thicknesses of 1/16 inch plus or minus. This is ideal where a thinner flat overlay is required. A typical use would be where a floor needs to be leveled. Another typical use would be for a “scratch coat” which is where you are trying to cover large amounts of chips and divots in the floor. Broadcast Aggregate Product #77 is broadcast into wet #10 in order to produce an anti-skid surface. It can be broadcast into a neat coat (just the resin and hardener mix without the aggregate) of #10 or into the Mortar Blend Aggregate or Self Leveling filler systems above. In addition to being able to mix the #10 with the fillers above, you can also mix it with Product #71 Fumed Silica to make a paste for cracks and other small imperfections. In summary the Epoxy Mortar Resin Product #10 is a versatile epoxy mortar system available in many colors, several cures and different fillers for different purposes. This makes Product #10 an important part of your floor repair tool chest. System #495 Elastomeric Polyurethane Traffic Membrane System– is an Elastomeric Urethane Membrane System, that is liquid applied. 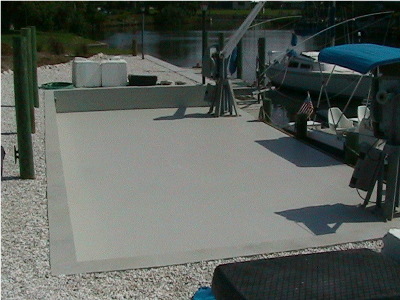 System #495 Elastomeric Polyurethane Traffic Membrane System is seamless, elastomeric (flexible), and UV. Thee qualities make it an excellent choice for outside applications in direct sun and weather, where water tightness, durability, and excellent appearance is required. Its elastomeric properties will allow horizontal movements up to 1/8 inch without breaking. System #495 Elastomeric Polyurethane Traffic Membrane System has excellent abrasion and chemical resistance. The surface of System #495 Elastomeric Polyurethane Traffic Membrane System can be varied to achieve the required anti-skid and decorative look. This entry was posted on Friday, August 8th, 2014 at 12:14 and is filed under Chemical Resistance, Chemical Resistant Epoxy, Concrete Repair, Epoxy, Epoxy and Urethane Material Calculators, epoxy concrete floor patch, epoxy concrete repair, Fast Setting, Installation, patching concrete with epoxy patching material, repairing concrete with Epoxy, seamless epoxy floor coatings, seamless epoxy flooring system, Seamless Epoxy Flooring Systems. You can follow any responses to this entry through the RSS 2.0 feed. You can leave a response, or trackback from your own site.